So many wonderful things happened this past weekend, like almost a foot of new snow on the local ski hill Friday morning. Rest assured, I did get my fresh tracks first thing in the morning. 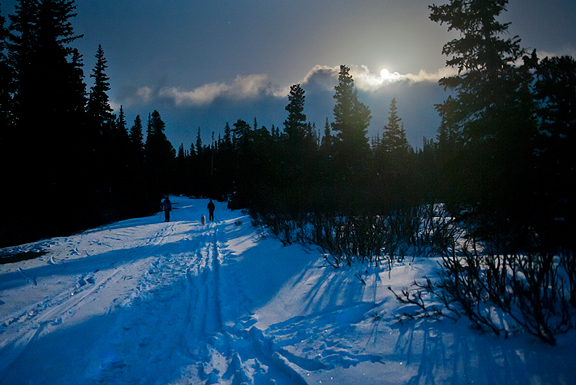 The new snow also meant that we could do a full moon ski rather than a full moon hike that evening. Everything seemed to go in our favor that night: fresh snow, no winds (well, a very light breeze), full coverage on the road, clear skies. Almost unheard of for our area. We got home from the full moon ski around 10:30 pm and ate dinner at 11:00 pm. 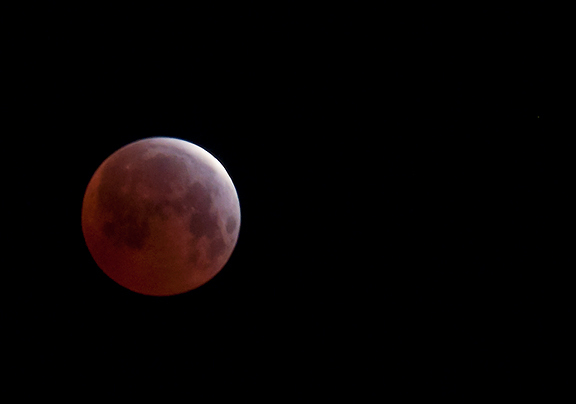 I was in bed after midnight and set my alarm for a few hours later as there was that total lunar eclipse to catch. 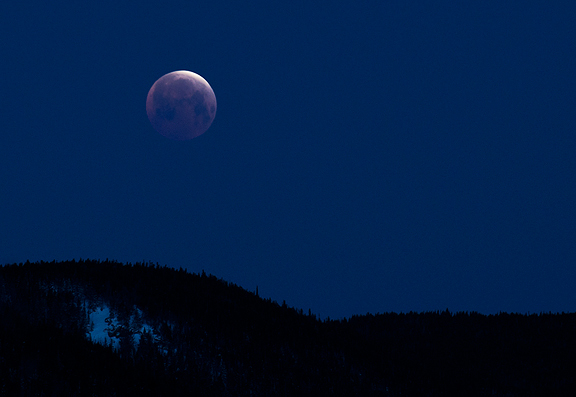 When it’s late and I’m tired, I sometimes question if I want to get up in the middle of the night to shoot the eclipse. I figure, if I can and if the conditions are good (they were excellent), then it’s definitely worth seeing. I don’t think I ever tire of watching these phenomena that relay just how small we really are. Besides, I’ve loved watching the moon ever since I was a little girl. Some things never change. Jeremy even got up with my alarm and brought me hot cider while I stood outside following the eclipse’s progress. We watched her set behind the Continental Divide, still eclipsed, as the eastern horizon began to glow warm with orange and gold. The 6 inches of snow around our house melted in no time flat. Warm weather returned and I’ve notice those fuzzy aspen catkins blowing around on our deck. We moved the deck furniture back outside from its hibernation in the basement and our windows have been open every afternoon to let the mountain air cool the house down. 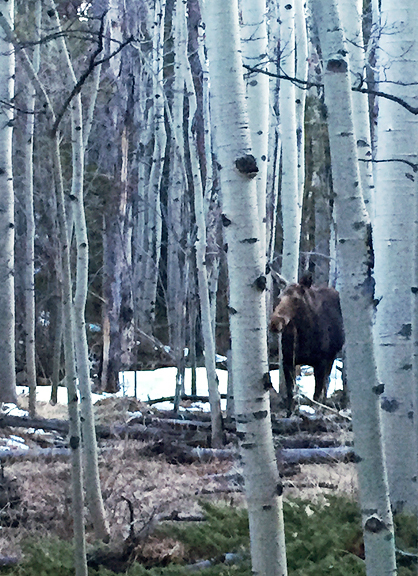 Instead of an afternoon ski tour, we’re trail running the local trails to scout out conditions (mostly melted, still some snow) and visit with our local flora and fauna. 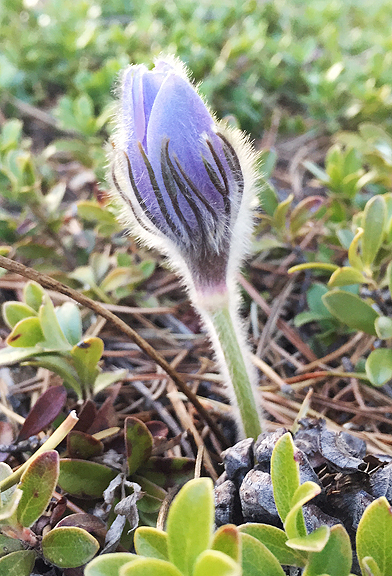 Over the weekend, all of our neighbors’ yards or decks were filled with happy dogs wagging their tails with noses in the air sniffing the aromas wafting from smoking grills. We contributed our fair share of grilled deliciousness to the local atmosphere, too. Although we weren’t grilling giant hunks of meat, our pizzas still paid proper homage to the pig. Vegans, vegetarians, pescatarians, flexitarians – look away! I call the pizza This Little Piggy. 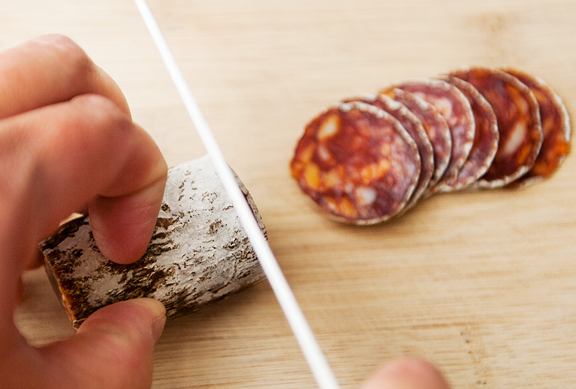 It all about the pork – and good pork at that. Of course, it’s a pizza, so this is whatever you want to put on the pizza. 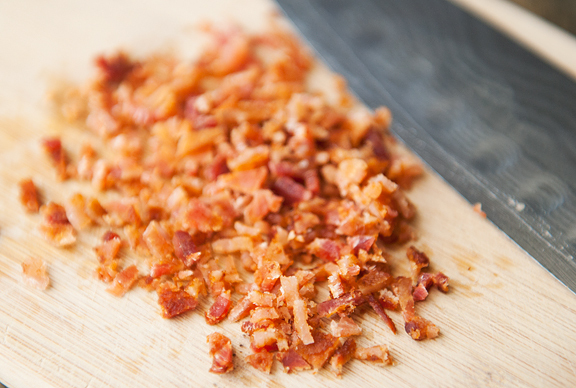 Maybe you don’t want pancetta and prosciutto, but have pulled pork and Canadian bacon instead. Go for it. Mix and match! I think it’s all good. 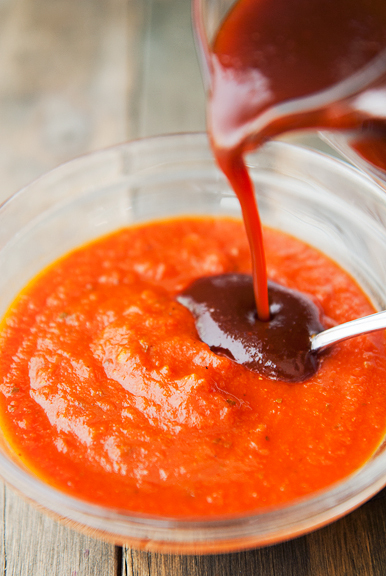 I combine a little bit of a sweet, tomato-based barbecue sauce with the pizza sauce (1:4 ratio barbecue sauce to pizza sauce). You don’t have to do that, but I think the touch of sweetness and smokiness works well with the caramelized onions and the meats. It’s not overpowering, but it is definitely there. 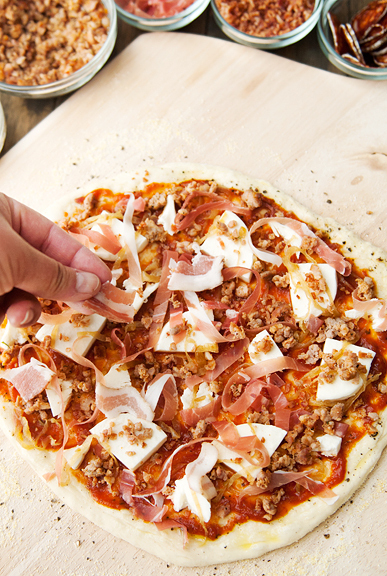 The pizza itself is quite quick to assemble and cook, but do yourself a favor and prep your ingredients ahead of time. You can caramelize the onions, cook the bacon, and cook the sausage a few days in advance. The olive oil pizza dough I use can also be made up to 2 weeks ahead. 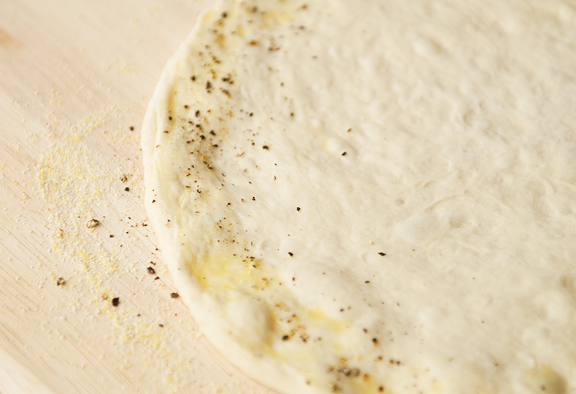 We’ve found that we really love the edges of our pizzas to have a salt and pepper crust. It’s just a brush of olive oil on the edge seasoned with salt and pepper. If we’re not using a sauce, then we’ll apply this to the whole pizza base. Garlic butter works well in place of olive oil, too. The key to remember with thin crust pizzas (which is what we make) is to not load them up with too many toppings. It’s tempting, I know – I really know – but resist that urge so you can avoid undercooked dough or soggy crust or everything-falling-in-your-lap pizza. That includes going easy on the sauce. This is really about the Conservation of Toppings. There is a finite amount of toppings that the crust can sustain, so if you have three toppings, you can be more generous with the distribution than if you have, say, seven toppings. Ultimately, it will come down to experience. You’ll know when the pizza is too topping-heavy or topping-scant after your first few iterations. Once you’ve made a couple of pizzas, you’ll be a pro. I do highly recommend using a pizza stone. Ours lives in our grill (we take it out when we grill other things), although we occasionally use it in the oven. The pizza stone does a fantastic job on pizzas in either appliance, giving a nice crisp crust and even cooking. But if you don’t have a stone, you CAN use baking sheets. There are tricks and tips on the internet to help you achieve similar results to a stone using baking sheets (if you’re interested, just google for it). So how did the pizzas turn out? AMAZING! While neither of us are caveman carnivore types, there were so many lovely flavors bouncing around in our mouths that we both declared this a resounding success. 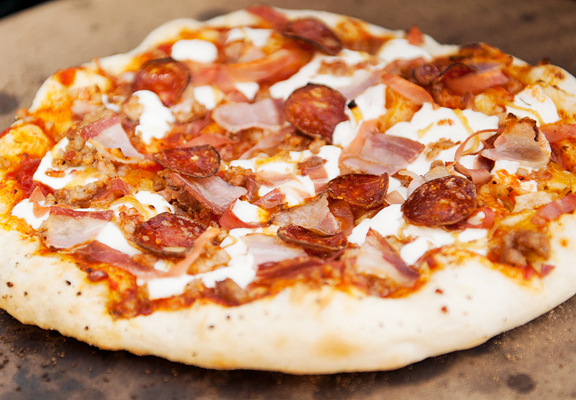 The chorizo and Italian sausage add a little kick of heat, the bacon is smokey, the caramelized onions and barbecue sauce lend some sweetness to balance the salt from the prosciutto and bacon. I wasn’t sure about the inclusion of the pancetta before I made the pizza, but I definitely like that extra bite of fatty goodness that rounds it all out. I’m psyched to add this combination to my collection of favorite pizza recipes. If using an oven: Place your pizza stone on the center or lower third rack of your oven. Preheat the oven to the highest temperature (mine is 550°F). If you don’t have a pizza stone, you can bake your pizza the way you normally bake pizza. If using a grill: Place your pizza stone on the grill and turn the flame or heat the coals to high heat. Close the lid. We’re aiming for 450°F to 500°F. 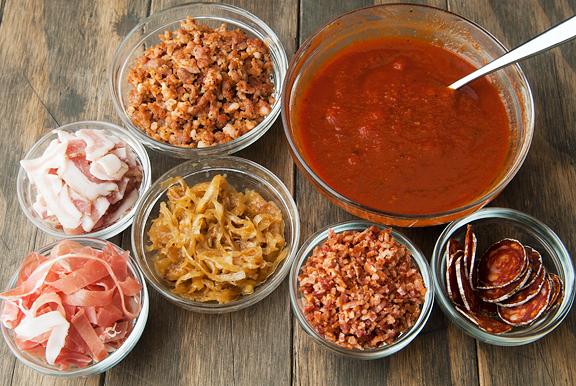 Mix the pizza sauce and barbecue sauce together. 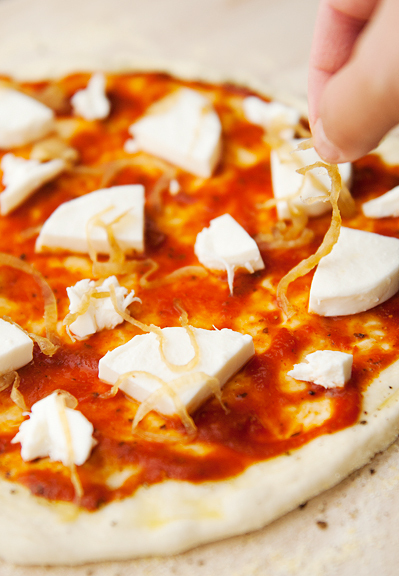 Make the pizza: Sprinkle cornmeal on your pizza peel – enough to keep the dough from sticking to the peel. 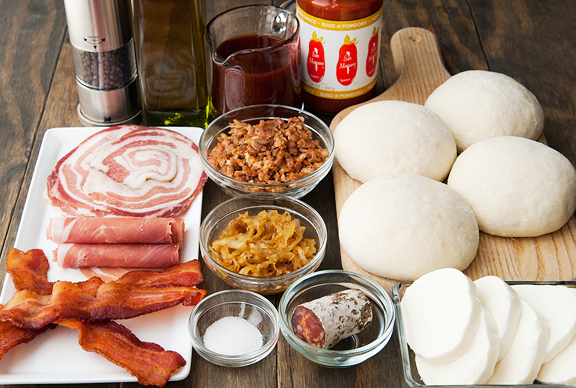 On your work surface, roll or toss a pizza dough ball to about 12-inches in diameter. If you need it, use flour to prevent sticking to the work surface. Set the dough on the pizza peel. Brush olive oil on the outer 1-inch rim of the dough (or on the whole thing if you prefer). Sprinkle sea salt and black pepper over the olive oil. 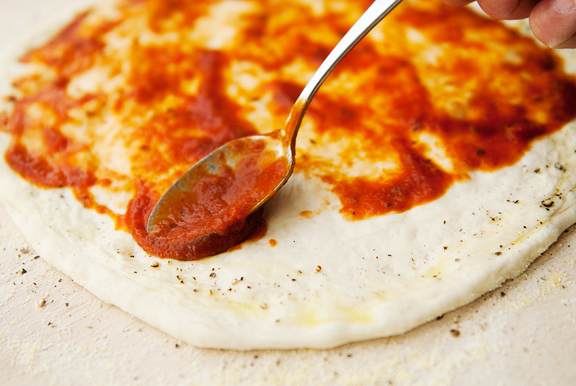 Evenly spread a quarter cup of the pizza sauce on the dough. Don’t make it too thick or your pizza will be soggy. 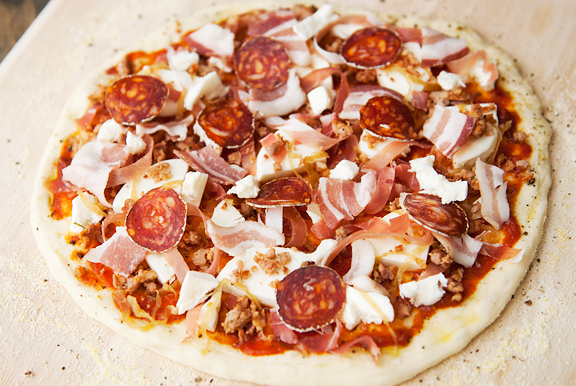 Distribute mozzarella, caramelized onions, prosciutto, bacon, pancetta, Italian sausage, and chorizo on the pizza dough. Take care not to over load the pizza. 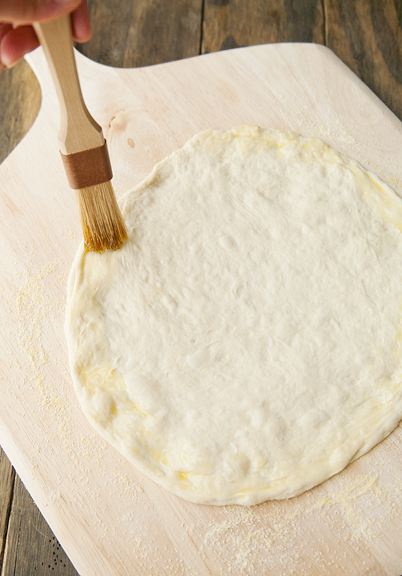 Bake: Before baking the first pizza, shake the peel to make sure the pizza isn’t sticking (if it is, gently use a dough scraper or a knife to unstick it and toss a little cornmeal or flour underneath the trouble spot between the dough and the peel). Set the tip of the peel on the far end of the pizza stone and give it a jiggle so that the pizza begins to slide off and the edge is resting on the stone. Pull the peel out from under the pizza at an angle (to encourage the pizza to disengage). Bake for 8-10 minutes, or until the cheese is bubbling and the crust is browned (but not burnt). If you get puffy bubbles of dough rising up during baking, puncture them with a meat fork (or a skewer, something sharp) to deflate the pockets. When done, remove from heat and serve. Repeat for the rest of the pizzas. Serve hot. Makes 4 12-inch pizzas. Looks amazing!!!! 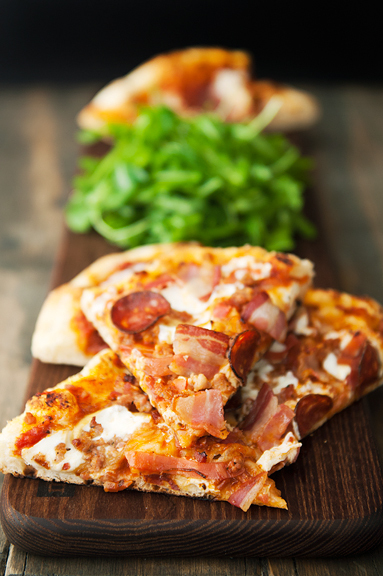 You are so right about being careful not to overload the pizza-it’s definitely a temptation! Rather than a special pizza sauce, I use crushed tomatoes that I break down with an immersion blender a bit. That simplicity has won me over! Might be worth a try for you? Thanks for the great pics! Wow. Heaven for my son! Think I’ll stick to veggies & cheese! Oh my goodness! It looks so delicious! Amazed and thrilled at your pictures of the blood moon! So perfect it did not even seem real. The blood moon means much to us concerning our faith and so I am so grateful to see these pictures. Your talent is amazing and I enjoy each and every picture you take. And I want to give this pizza a try too. Thanks so much! 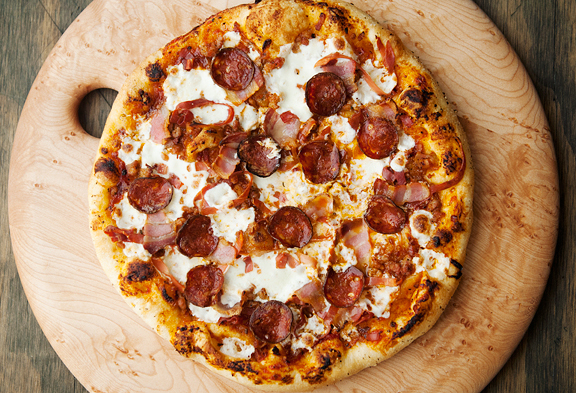 Nothing is good compared to home-made pizza – It makes me want to go out for a long ride and come home to eat this! Thanks, Jen! 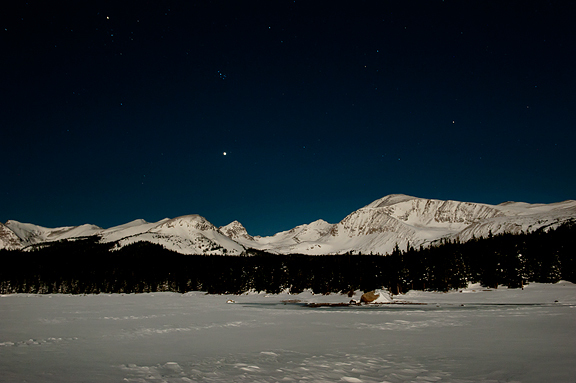 The night sky over Colorado is phenomenal!!! I didn’t get up for this one and many thanks to you for doing so!! This pizza is right up my alley. Can’t wait to try making it! And eating it too. Wow, what a great moon pic, thanks! Thank you for those eclipse photos. They are gorgeous and so beautiful! Kristin – I like loads of veggies too, but variety is the spice of life! 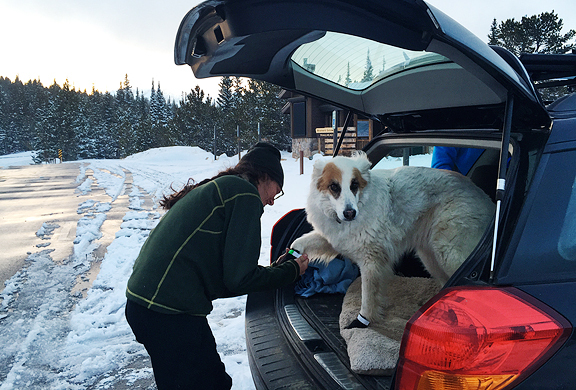 Christine – Banjo is a super sweet pup! 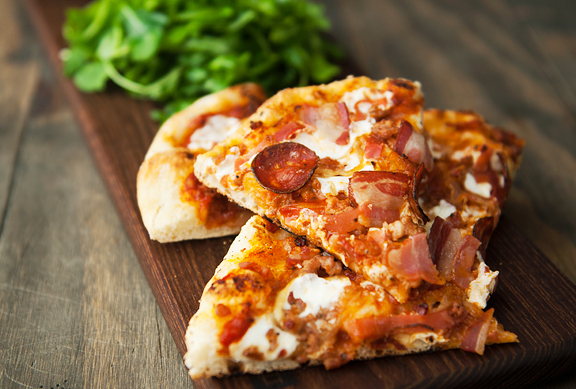 megan – love love love garlic on my pizza! debbie – aww, thank you. This is awesome. I agree with not overloading the pizza. Everything is so perfect in this pizza. I am tempted and I want pizza right now. This pizza looks delicious and there is so much addings on it, must be delicious. Saturday morning here, pouring again…hope this means snow for you! Catching up on 4 or 5 URB’s. Nice! Oh that Banjo is a sweetie pie. Bet you can’t wait for your pup! That blood moon is gorgeous, and how lovely that Jeremy brings you a warm drink. What a guy!